Goals are important. But being obsessed with your goal often makes you feel empty and lost when you finally attain it! A couple of days back we watched the much acclaimed Tamil film “Kaakka Muttai” (2014, Manikandan) one more time. The film tells the story of two kids, brothers, from a slum and their travails to save money to buy a pizza. When they finally do get to eat a pizza both of them conclude that they didn’t quite like its taste. The film closes on this note and, as the credits roll, the best part of the film, a song plays in the background. The song composed and sung by G.V.Prakash Kumar, with lyrics by Na Muthukumar, sums up why Life is sometimes so listless and meaningless despite all the trappings of material success. The song means that when we chase our desires, our wants, we often end up attaining them. Only to discover the truth that we feel lost, empty, unhappy too, with what we have attained! There’s no limit to desires, no one has ever conquered them, and the obsession to achieve those wants sometimes makes Life miserable. If you understand Tamil, the simplicity of the lyrics and GV Prakash’s soulful rendering will uplift your mood. The essence of Na Muthukumar’s and Pandit Jasraj’s perspectives is this: the journey is more important, in fact it is sacrosanct, than the destination. 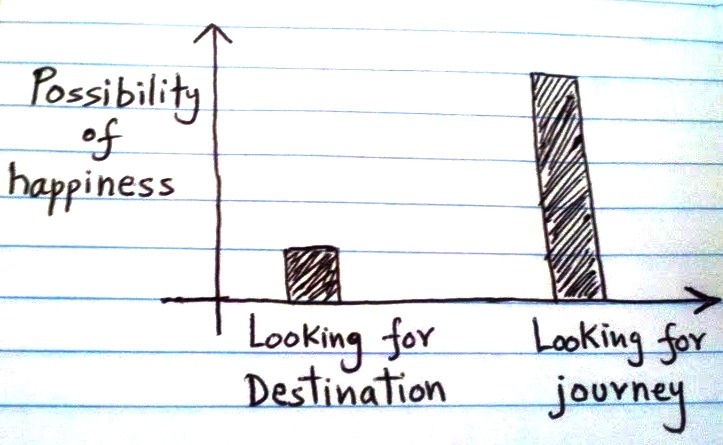 So, simply, enjoy the journey more than obsessing with the destination. Most people understand this as a call to drop desires and to stop wanting. But how can you drop desires? Desires are born in the mind. A thought becomes a wish which becomes a want. So, as long as there is the mind, there will be wants and expectations. And expectations always bring agony! The better thing to do is to become more aware of the true nature of Life. Understand that whatever you desire, want and achieve – name, fame, glory, wealth, power and position – will not go with you when you die. So why obsess so much over what you can’t take with you and what can never be yours permanently? This doesn’t mean you should not be ambitious or competitive or excel at whatever you are good at. It only means that you must enjoy the process of living more than merely wanting to achieve a goal. “Kaakka Muttai” helped me, yet again, visit a significant spiritual tenet: the journey is always sacred while the destination has no meaning! I believe the greatest service we can do to ourselves is to wake up, pause and smell the roses, drink in the scenery along the road, than worry and agonize about when and how we will get to our destination.